By Andrew Follett in Web Design. Updated on August 3, 2018 . In this following post, I want to share with you 7-step framework for getting better website feedback each and every time. Full article after jump. 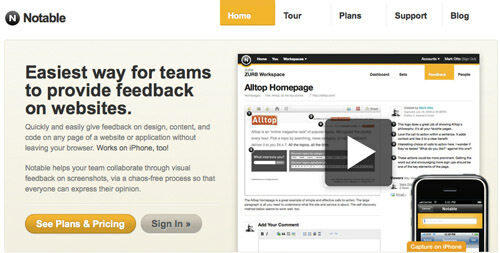 Feedback should be part of your production plan from the moment you start working on a new website. The earlier you start asking for feedback, the easier it will be to make a change. Don’t wait until you’re emotionally invested in your design to start getting feedback. 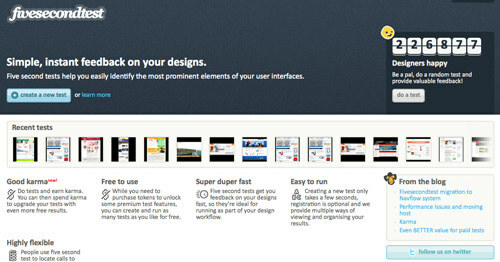 As soon you have a sketch or a wireframe, put it in front of other people and see what they think. This goes back to emotional investment. If you’ve already made up your mind about a website, and there’s no changing it, no matter what anyone says, then don’t waste your time (or theirs). Seek feedback only when you’re going to pay attention to it. Don’t become so attached to a design or layout that you can’t hear the constructive ideas being offered by those around you. People often avoid asking for feedback because of an unproductive past experience. Either the people asked didn’t respond, or there was no good way of collecting the feedback. Fortunately, there are a number of free tools out there that are designed specifically for gathering feedback in an organized and actionable way – no more patching together ideas from a long string of emails. 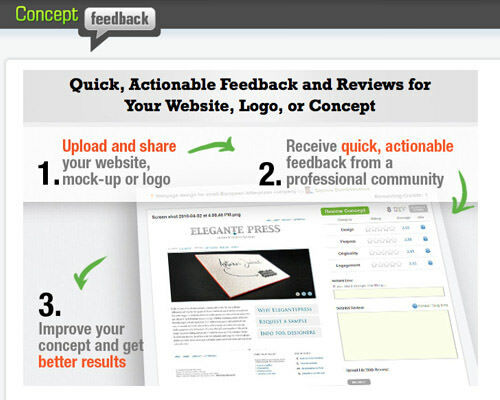 Concept Feedback – Concept Feedback is a free website feedback community for designers, developers and marketers. Members can upload a concept a website, specify an objective and start receiving constructive, actionable feedback from other members. A system of reputation points keeps users honest and helps prioritize advice. Sensitive concepts may also be posted privately for client or co-worker review. Five Second Test – The name says it all. Fun and easy to use, FST gives random visitors the chance to “take a test” and look at your design for 5 seconds. When time runs out, the user is asked to list everything they can remember from the concept, providing what FST describes as a “simple online usability test that helps you identify the most prominent elements of your user interfaces”. Notable – Notable is a website feedback app designed specifically for team and client settings. A web page can be uploaded using an image, screen grab or a plug-in for Firefox that allows you to give or receive feedback on any website or application without leaving your browser. A free plan is available (although you need to look for it) and paid plans start at $24/month. User Testing – For $29, you get a video of a remote tester using your site, speaking their thoughts out loud as they go. You select the demographics, provide a list of tasks and watch as they navigate through your site. Live user testing can provide some excellent insights in to the sticky areas on your website and how to improve them. If you don’t want to pay, you can always setup a makeshift testing lab and pull in your friends or co-workers. Often, the results can be just as good, if not better. You don’t need an expert to give you valuable advice about your latest website, just someone who is going to look at it seriously and give you an honest response. Everyone, whether they have a Ph.D. in Computer Science or lack any relevant website experience, can contribute something of value. Sometimes, the most insightful feedback, comes from people who don’t know much about web design at all, but are able to spot something that is confusing or difficult to use. Join a community, ask your friends and family, post your idea on Twitter or grab a complete stranger. Whatever you do, don’t be shy, get out there and share your website with anyone who’s willing to take a look. Make sure to clarify your objective. By providing direction ahead of time, you’re more likely to receive focused feedback that clearly addresses what you want to know. Instead of asking “what do you think?“, ask “what elements of this design catch your attention right away?” or “what confuses you most about this website?“. Also, try to keep it brief. Clear and concise directions generate specific and helpful feedback. Whenever you’re faced with criticism, make sure to check your first reaction. Are you just snapping back because your design is personal? It takes a mature designer with the right attitude (see #1) to be able to take genuine, constructive criticism and learn from it. Criticism never feels good at first, but once you’re able to take a step back from your design and look at it objectively, you can usually find something helpful. For an in-depth look at responding to criticism, read my article on Smashing Magazine. Feedback is an ongoing process. Don’t just stop after the first draft, continue to get feedback as you revise and improve your design. The more you times you repeat the process, the easier it will be to get in to the habit of asking for feedback and the better your websites will be as a result. So whether you have an existing website, or a brand new concept, try using these 7 steps to uncover new ways to improve your work. If you have other ideas, resources or suggestions, please feel free to share them in the comments below. Editor’s note: This post is written by Andrew Follett for Hongkiat.com. Andrew is an online marketing consultant and the founder of ConceptFeedback.com, a website feedback community for designers, developers and marketers.